If it is of any consolation between my last post and this - I'm back 3 days before the "monthsary" since the last time I came around! I attribute it mostly to laziness and a mundane lifestyle of simply going to work and heading home to be fat, but I promise to come around when something interesting happens...which is, I suppose the reason for this post! And as I write this, I'm going to go with a disclaimer that I was not sponsored! 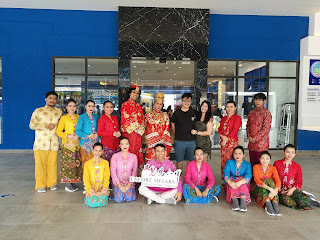 You see, a week back I was in Malacca with my other half to celebrate my 26th birthday and he suggested we catch the local performance known as Encore Melaka. 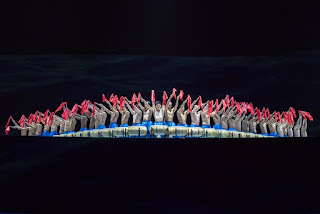 It was a 70-minute live stage show comprising of 200 local performers and art directed by the China-based Wang Chaoge - the lady who made the opening of the Beijing Olympics 2008 a success. 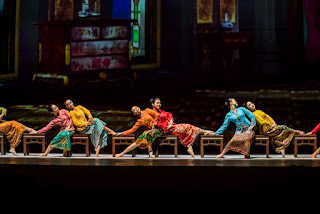 Set in Impression City of Kota Laksamana in Malacca, the theater that hosted Encore Melaka was said to be able to fit 2,000 audiences per show and the best part of it was that it had a 360-degree rotating audience platform. Out of respect for the performers who worked hard to put on a show for the audience, I stood firm in keeping my phone away during the entire show. They didn't have much restrictions for that however, so I think you're most free to snap away as long as you don't distract other members of the public or the performers themselves. I however, opted to source for photos online and leave credit where credit is due for this post that I could not leave unwritten. For starters, Encore Melaka is a separated into a 7-part story that tells of the history of the state. This included how the state was founded by Parameswara and how the name "Malacca" was inspired by the sight he saw while resting under the Malacca tree. Legend and my history books from school tells me that it was how he saw a mouse deer outwit his hunting dog, even kicking the latter into the river. Vicious, but it got Parameswara thinking that the land of Malacca was so strong, even their animals didn't just give up on life. As the story forms, you'll begin to learn how the traditional Baba Nyonya culture came to be in Malacca before it slowly turns to a swirl of confusion. 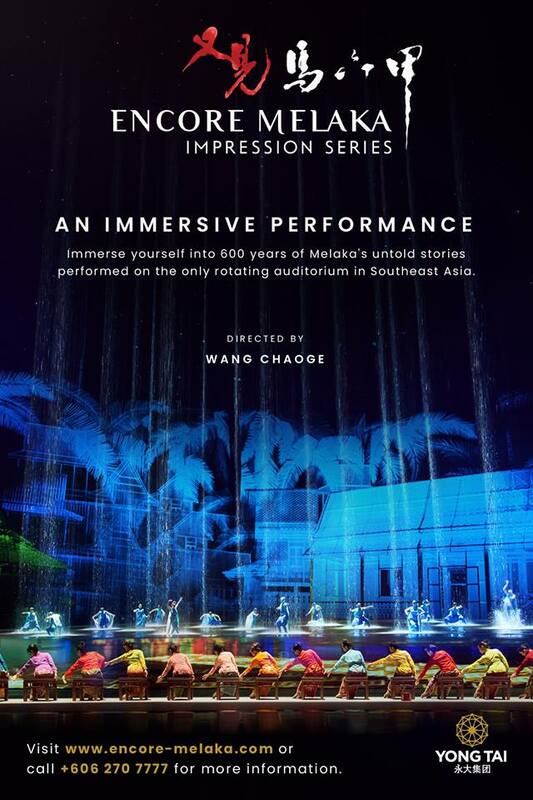 That's right - towards the 3rd or 4th story, the Encore Melaka performance had completely lost me on what they were trying to portray but the beautiful colours, lights, and dances didn't fail to put a smile on my face. I suppose it was from a lot of awe rather than understanding the story. 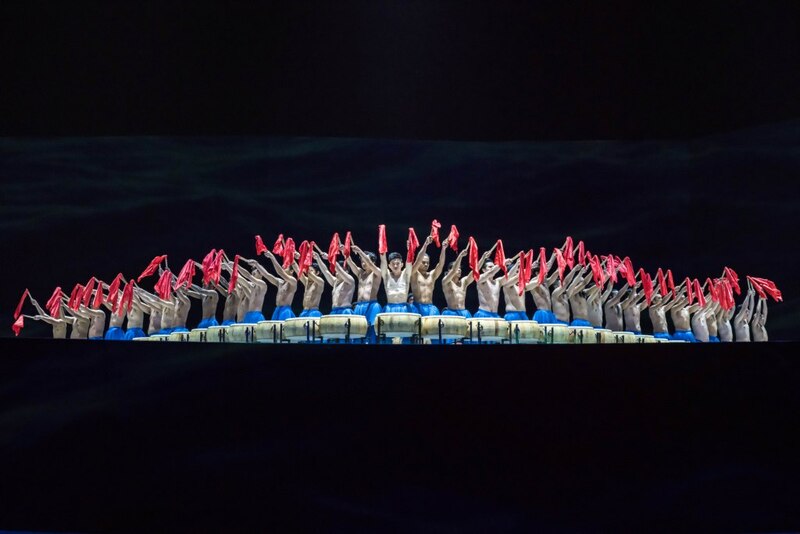 Despite minor shortcomings, I must say that Encore Melaka did not fail to surprise and the fact that the audience was seated in a 360-degrees rotating platform meant that you got to see a constant change in background flashing by your eyes. The movement of the platform is rather subtle and you don't notice it that much unless you're extremely sensitive to movement and sounds, but it's not enough to distract you from the beauty of the ever-changing stage. Think of it as that you're taking a gentle train ride that simply transports you from one century to another. Truth be told, I was fairly sad when the 70-minutes were up because I truly loved the colours and costumes they had sourced out for the performers. 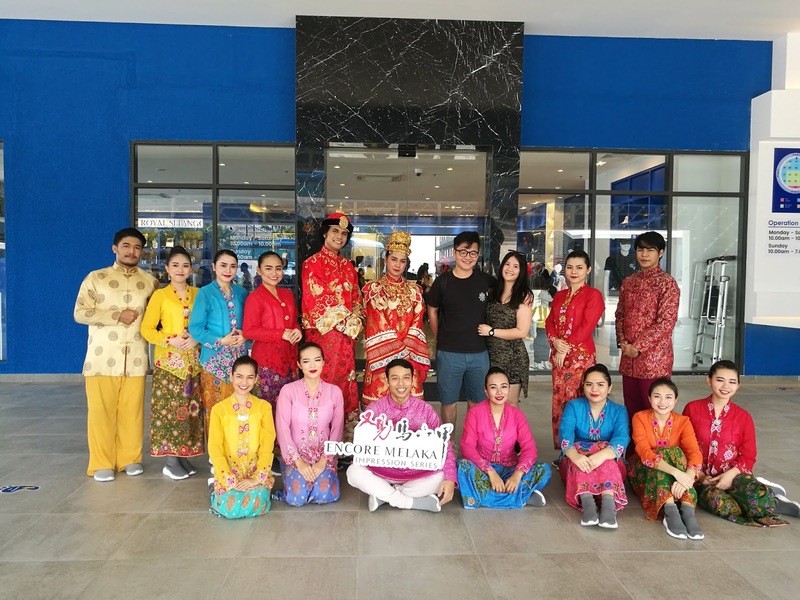 This is why excitement soared as Encore Melaka put in a touch of hospitality to the end of the show, allowing the audience to take a picture with their performers who were still in full costumes. The photo sessions were done in a really orderly manner, whereby a member of their staff would be ready to help you with your phones and cameras and do not cram different groups of public for photos together. Performers are usually scattered across the surroundings of the theater and ready for pictures, so there's definitely one or two you can catch for a photo opportunity. 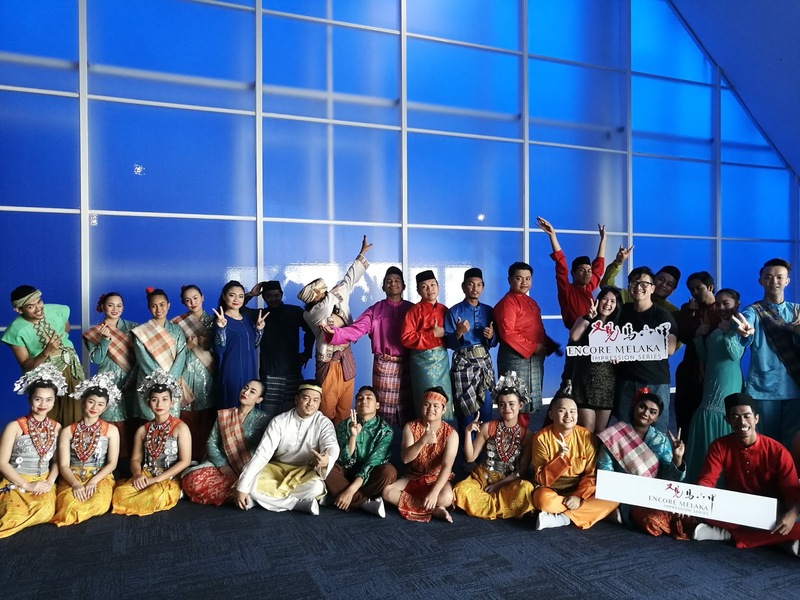 My favourite had to be this group that featured the "bride and groom" because of their Baba Nyonya bridal costumes by the ticketing counter. I salute them for putting on big smiles in all the pictures they had to take despite the heat and the costumes they wore, because I for one had to quickly hide in the souvenir shop while waiting for our GRABcar after. Tickets are available on the official Encore Melaka website, or you could try your luck by getting them at the ticketing counter right outside the theater. 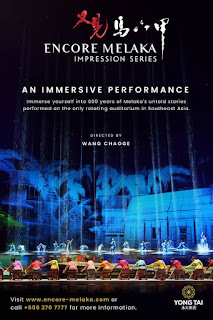 It's definitely a show you should catch if you're in Malacca, because it did feel like a once in a lifetime experience. Prices start at RM 128 for the standard seats and could go up to RM 528 for the VIP seats. I for one think that if you could fork out a little more for the RM 228 premium seats, you'll enjoy the show just a tad bit better. After all, you will get a more wholesome look across the 240-meter long stage but that doesn't mean the regular seats are all that bad. Do be warned however that strobe lighting effects are used at one point of the show, which gave me a slight headache and I wish they told us about it before the show began. It's a point of the performance that people who suffer from photosensitive epilepsy should avoid - or perhaps speak to any of their many helpful staff members if you need assistance.